A man and his dog observe a view of Boston from Peters Hill in Harvard's Arnold Arboretum, which is the site of an 18th-century burial ground. Hidden Spaces is part of a series about lesser-known spaces at Harvard. 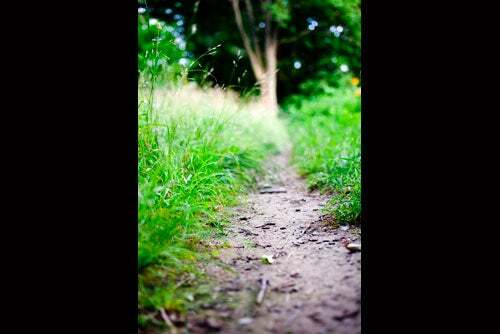 Each July 4, as night falls, the Roslindale neighbors who live near Peters Hill in Harvard’s Arnold Arboretum walk to the top. Someone brings a radio, and they listen to the Boston Pops Orchestra play the “1812 Overture” while they watch the fireworks burst brilliantly over the Charles River. 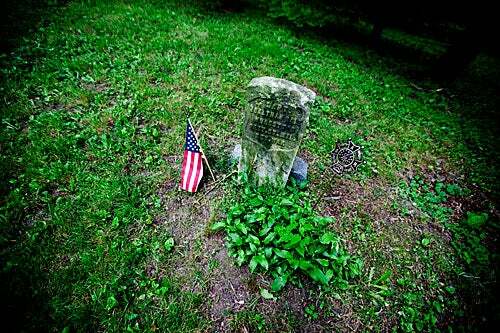 Near the base of the hill, among tall trees and along narrow dirt paths, lies a little-known cemetery containing the remains of veterans of the American Revolution and early settlers — an ideal place for pondering the meaning of the nation’s birthday. The little cemetery, hidden at the far end of the 265-acre Arboretum, holds several headstones and a crypt and was once part of the Walter Street “Berrying” Ground. 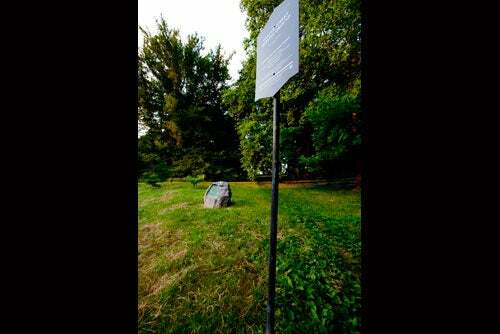 The “Jamaica End” settlers of the early 1700s belonged to the distant Roxbury town church on Meeting House Hill. The long walk to services was especially difficult during the cold winters, so a group of 44 petitioned to establish a second parish. In 1711 when their petition was ignored, they quietly broke away. Alongside their Walter Street church they built the cemetery, now part of the Arboretum, which was established in 1872. Around 1902, when the city of Boston was widening Walter Street, workers found 28 other bodies. A marker above the sidewalk reads, “In memory of Soldiers of the Revolution who died in the hospitals at Jamaica Plain and were buried in this lot. 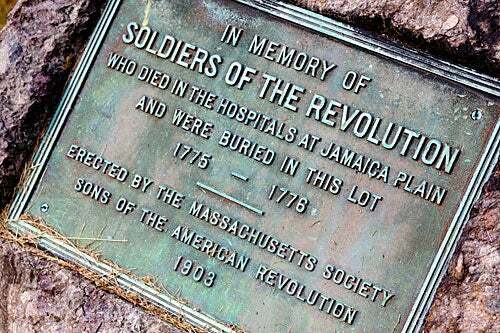 1775-1776.” One account is that the soldiers were killed fighting in the Revolution; another is that they died from smallpox while stationed at nearby Loring-Greenough House, which had been converted to a hospital. The ancient burial site is a hidden space within a hidden space, far afield from the main Harvard campus. 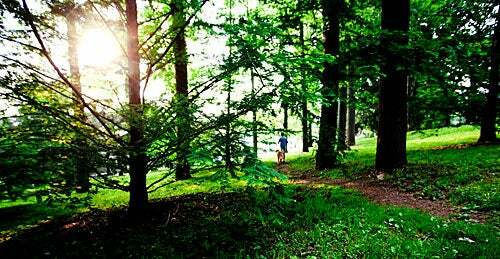 Arnold Arboretum is the second-to last-link in Boston’s Emerald Necklace, a series of connected parks. The views of Boston from this southernmost tip of the park are remarkable. So are the stories of those buried in the tiny cemetery. The pathway from Walter Street at the entrance to Peters Hill in Harvard University's Arnold Arboretum leads to an 18th-century burial ground of early settlers and Revolutionary War soldiers. The weathered stone of Capt. Jonathan Hall is decorated with a small contemporary American flag and a 1776 commemorative marker. Hall fought against the British and the words "Rev. War" are crudely engraved on his stone. 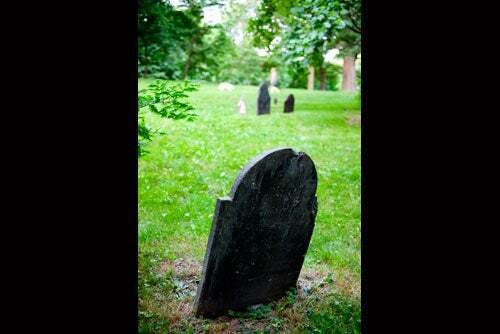 An aging headstone no longer stands at attention, finally permitted some leniency. 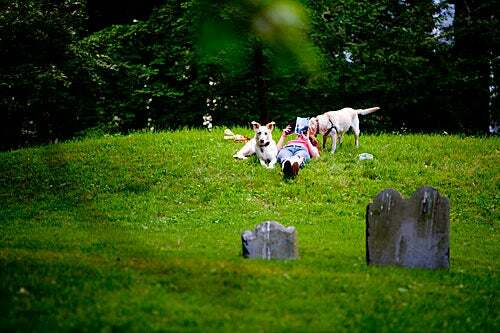 Dogs and people share the grassy lawn on Peters Hill where early settlers are laid to rest. 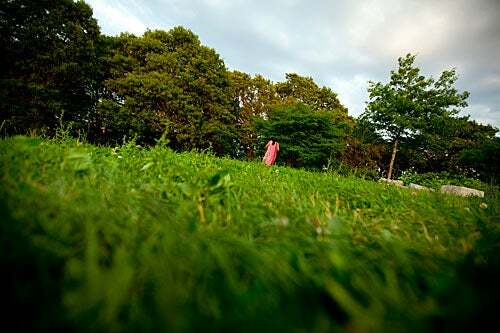 A large expanse of lawn at the top of Peters Hill dips down to an apple orchard. 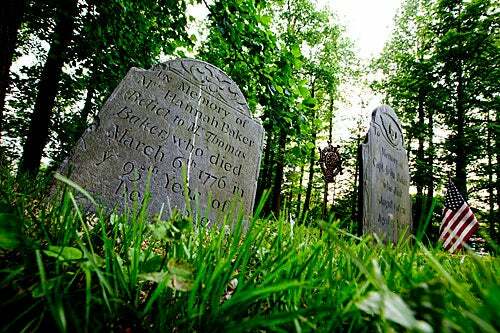 In 1776, Hannah Baker, who lived until the age of 95, was buried beside her husband, John, who had died at the age of 83. His epitaph reads: "Life is uncertain. Death is sure. Sin is the wound. Christ is the cure." The ancient burial site is a hidden space within a hidden space, far afield from the main Harvard campus. The remains of 28 Revolutionary War soldiers were discovered in this area around 1902 and a marker was erected at the base of Peters Hill in remembrance. 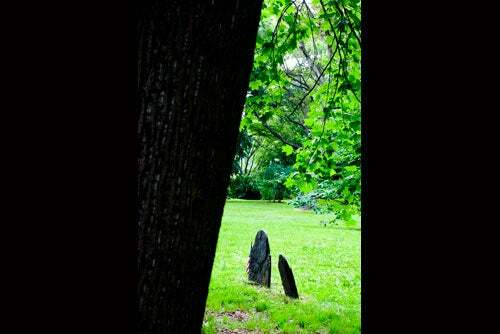 Trees frame two aged markers at the 18th-century burial site on Peters Hill. 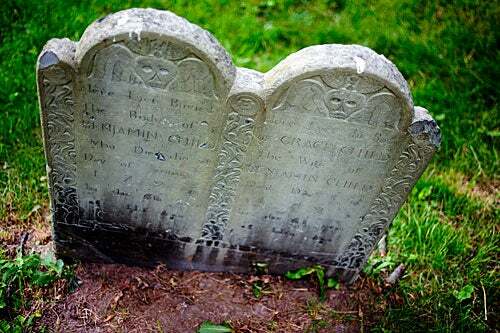 Grace and Benjamin Child, husband and wife who died just over a year apart in the 1790s, are buried side by side under a double headstone on Peters Hill. A narrow and natural pathway borders the burial site. 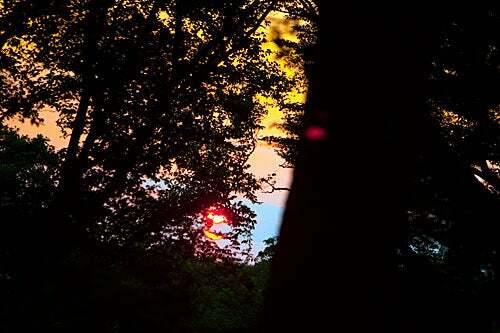 The sun sets through the trees on Peters Hill in Harvard’s Arnold Arboretum.